Weekends are for sharing time and good food with family and loved ones. Food lovers can spice up the usual spaghetti to make it more exciting and extraordinary with this delicious recipe from El Real Pasta. Make weekend salo-salo with the fambam even more enjoyable with Spaghetti and Spicy Bacon Shrimp in Garlic Sauce, made with El Real Spaghetti. With the pasta’s “yumayakap ang sarap” goodness, your loved ones can surely savor the flavor of the garlic sauce that perfectly complements the taste of the seafood. First, cook the El Real Spaghetti according to package directions, drain under faucet water and set aside. When ready to serve, blanch spaghetti under boiling water. In a 12-inch skillet, put oil and saute garlic and bacon until it changes color. Add the remaining ingredients and cook for 3 minutes. Turn off the stove and put in hot spaghetti. Transfer to serving platter and top with spring onion. Serves 4-6. 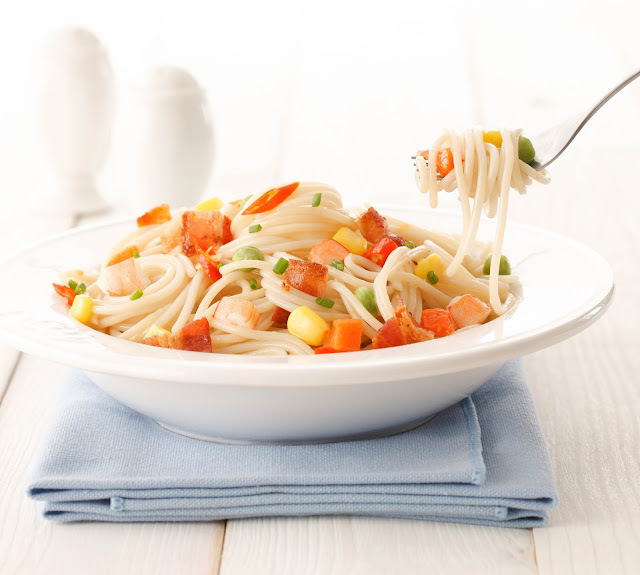 Make every dish rich with #RealSarap goodness with El Real Pasta! For more recipes, like and visit Facebook.com/ILoveElReal.